Seeing a little one shivering in the brisk winter winds from lack of a jacket is a sight that can make anyone jump to conclusions. Can they not afford a coat? Does their mom not care for them well? I hope they don’t get sick! Although we have all been guilty of judging another mother too quickly, this topic has a substantiated cause that you may not know about. Having little ones, you know the dance a parent has to do in an attempt to get the van loaded, and all the children safely buckled in their car seats. During the colder months, bundling everyone up just to rip it all off 15 feet out the door seems futile. The quick answer is that children wearing coats in a harnessed car seat is extremely dangerous, and experts recommend the jacket is removed beforehand. A now-viral Reddit post from u/MindyS1719 sends a warning to those who are mom shaming when they see a child without their coat in cold weather. She says please “don’t assume that parent is some kinda monster who doesn’t care of their kids freeze,” explaining how the new rules and regulations about coats and car seats make it difficult to keep a coat on at all times. Just as u/MindyS1719 also mentioned, most parents are doing the best they can to keep their kids warm and follow the safety standards laid out. Some kids don’t make it easy either. You may have one of those toddlers who keep trying to put their left arm in the right jacket armhole or the one that goes completely limp as soon you say it’s time to put your coat on. Now, this doesn’t mean that kids just don’t have to wear coats in sub-freezing temperatures because they don’t want to, but it does mean that if you have a 20-second walk to a warm vehicle then they will probably survive. The site report does not end there, however, Dr. Emily A. Thomas shares some practical solutions to keeping your little one as snug as a bug in a rug, without compromising safety. Putting a fitted cover overtop the car seat for smaller children keeps them warm with no need to bundle them up under the harness. If your child is older, try flipping the coat around so they can stick their arms in after they are buckled in. One mom responding to the viral post with her simple solution that makes putting something warm on and off quickly a breeze. This is a great idea! It offers a solution to the coat struggle with your child, while also diverting those judgmental stares on your way into the supermarket. 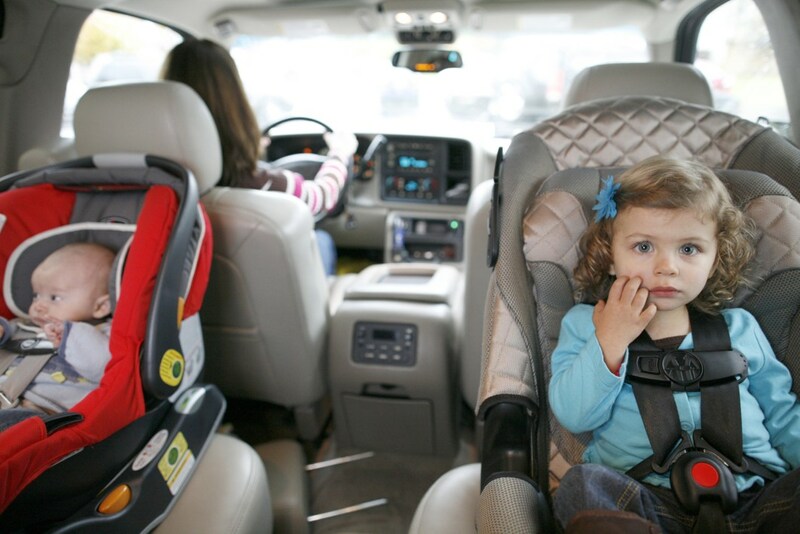 There is an easy test to do while your child is buckled in to see if they are appropriately tightened. Dr. Thomas says that you should not be able to pinch the webbing between your harness and forefinger, if you can, it is possible that the child can be ejected from the car seat in a crash. Put your child in the seat with whatever they are wearing, then tighten the harness. Take the child out without adjusting the straps and remove any outerwear. Put the child back into the car seat and see if you are still unable to pinch the webbing between your thumb and forefinger. If there is slack when the child is buckled without the outerwear, it means that it is too bulky to wear safely in the seat. Make sure you warm your vehicle up before putting the kids in as well, if possible. This will keep your children cozy even if you decide to run them to the vehicle without their jackets. Walking into the store, or a distance that will take several minutes or longer, it would be advisable to ensure every child is wearing appropriate attire to stay warm. Kids are not able to regulate their body temperature as well as adults and are more susceptible to hypothermia and frostbite. Knowing now that parents are recommended not to buckle their children in with jackets, you can hold off on the mean girl’s glare. Being a parent is a tough job, and keeping the kids all dressed perfectly at every moment of every day is nearly impossible. We do what we can to keep our children safe and loved, and it would be wise to operate on the assumption that all parents you see are trying to do the same unless they prove otherwise. Please let us know in the comments section if you have been mom shamed for having a child without a coat on in the cold weather.